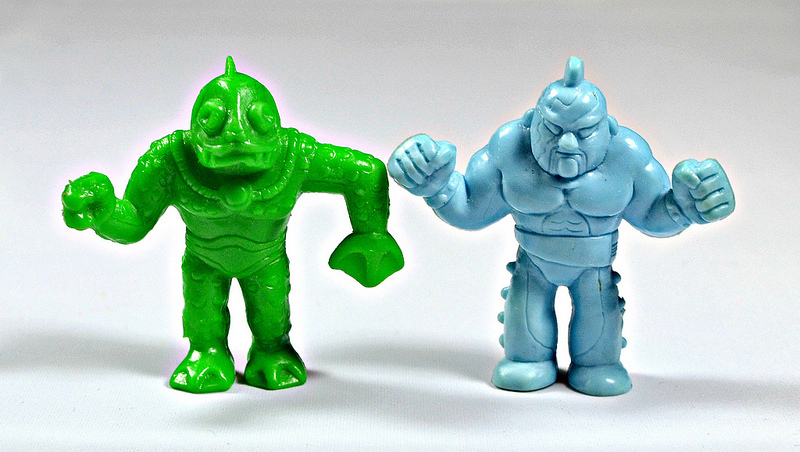 When I first blogged about Musclemania figures, I put up photos of the super squishy, super stretchy, soft rubber variety (because, well, that was the only kind I had). But there is a different kind of Musclemania figure out there that is, in my opinion, much cooler. See the dudes above. Not only do they appear weirder and more monster-like than the stretchy ones, they're also made of a MUCH better, nice soft plastic that's flexible but won't melt onto your other toys (my childhood stretchy Musclemania figures melted and gunked-up some of my other figures...and of course they gunked-up cool stuff, not something lame like my C.U.T.I.E.s). From what I can tell, this was the earlier variety of Musclemania toys, sold in 1984. There are a bunch of other sculpts and colors out there as well, which I'll be trying to track down. Yeah. I have those guys. I had gotten them in a 12 pack. My Mom had gotten them for me as a stocking stuffer wayyyyy back in the day. Still have most of them. Yeah, I was around for those, but I don't have any anymore. On a separate topic(sorry, I wasn't able to send you a message) there are some cool small, plastic glow in the dark creatures at Toys R Us right now! They are in their seasonal section. They have a pack of lizards, centipedes, spiders, and snakes. My son loves them! Thanks for the comment! Always great to hear about more little weirdos out in the wild.